Pimped, publicised and finally purchased, with all the proceeds of the sale going to Help for Heroes, the Pimp My Truck project is finally over, reports Colin Barnett – but not without the assistance of an army of generous participants. 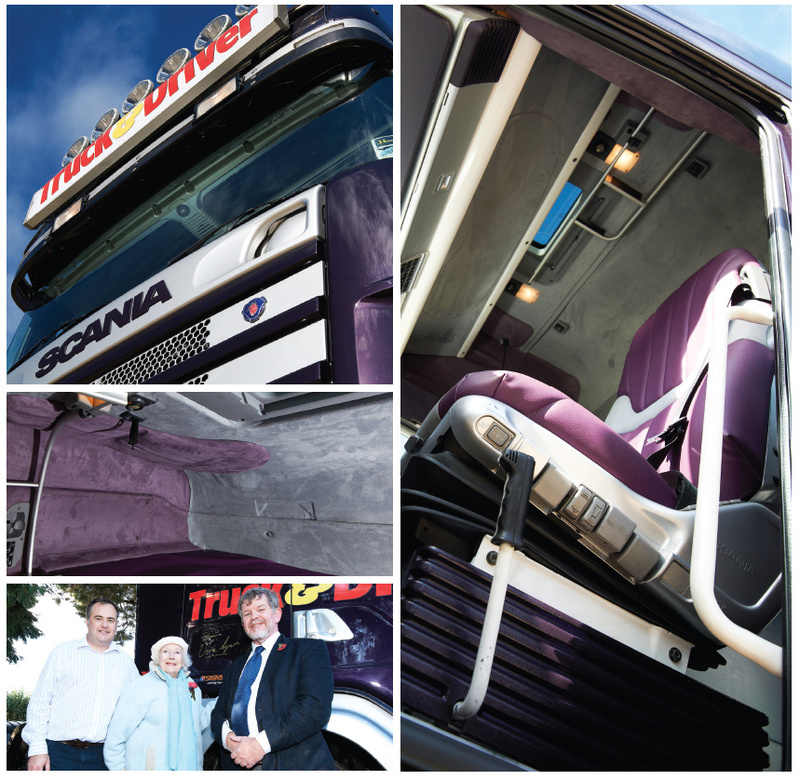 Rather longer ago than we planned, Will Shiers, the then editor of Truck & Driver, had the idea of creating a customised truck that could eventually be sold to raise money for the charity Help for Heroes. When Stoke-on-Trent used truck dealer Dave Watts, owner of DW Commercials, got to hear about the plan, he twisted a few arms belonging to Jim Warburton, of J&L Commercials, and Chris Hart and Paula Jefford of Trucks2Go. 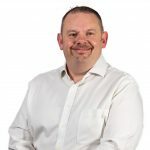 Jim Warburton soon sourced the truck, a 2002 Scania R124 420 6×2 tractor unit originally from MacFarlane with just short of a million kilometres on the clock, and the three of them joined forces to pay for it. Shiers’ original plan was to create something unlike anything else on the road. Early thoughts included making a unique stretched limo or grafting another cab to the rear, push-me pull-you style, but these were soon dilu-ted to some kind of pickup body. Eventually, though, the reality of appealing to the widest audience led to the decision to keep it as a straightforward, versatile tractor. Soon after purchase, work began on two major jobs. 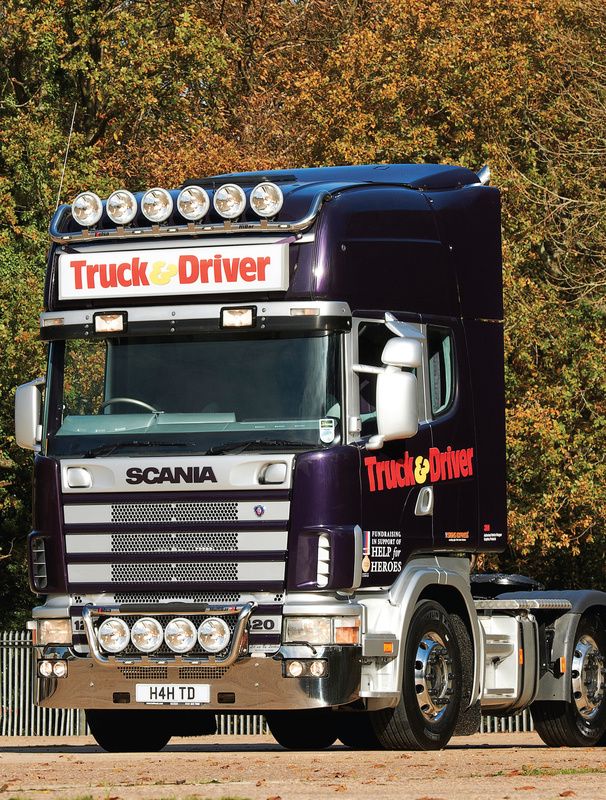 The Newark branch of Scania dealer Keltruck, which would go on to play a major role in the project, painted the exterior in its purple and silver colours. That the colour choice had any connection with the fact that Keltrucks’ depot manager of the day had recently painted his TVR a similar colour, and may have over-ordered the paint, was pure coincidence. 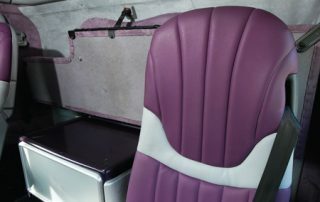 While the trim components were removed for the cab painting, they were sent down to Sparkford, Somerset, where the highly- respected family car trimming firm of LA & RW Piper commenced work in creating a suitable interior. A major crisis was averted when a company entrusted with painting the interior plastic parts went bust. The outfit was retrieved only by using tactics that might not have entirely come out of the insolvency administrators’ handbook, so no names here. 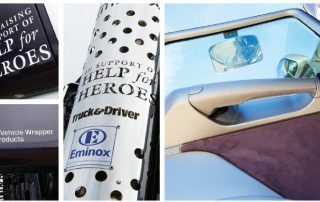 An early giant leap forward was made when Eminox created a unique stainless-steel exhaust stack, complete with laser-cut Help for Heroes and T&D logos. As the project moved on, it became evident that not only did the pipes look magnificent, they sounded pretty good as well. Chris Hopton at Tyretracks played a major role early on. Not only did he donate a set of alloy wheels, fitted with new tyres given by Michelin, he also provided the contact with Coles Custom at Banbury. 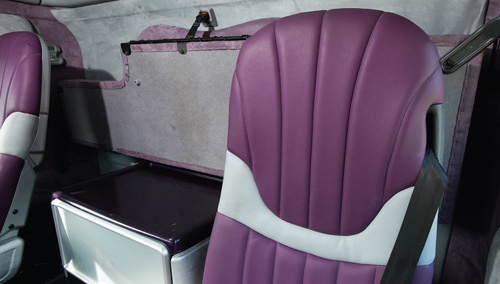 Behind the scenes, Gary and Nigel Coles spent much time coordinating the supply of various external access-ories from donors, including Hella, Kelsa and Spatz, as well as providing some of their own accessories, such as the front bumper. These were all eventually shipped to Newark, where electrical genius Kevin Larkin fitted the contents of a small accessory shop and got everything working. 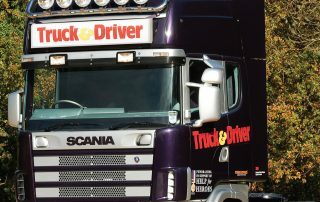 Another drama occurred when a driver from Uniloads, a firm invaluable in shifting the near-completed truck around the country, fell foul of a faulty fuel gauge. Not only did he run out of fuel late in the evening but during the night finished off the already tired batteries. Luckily he had stopped on the outskirts of Banbury and Coles was able to come to the rescue in the morning. Mindful of the danger of abusing our welcome at Keltruck, we eventually moved the truck to temporary quarters at Scania’s Milton Keynes HQ, where, among other things, a new set of batteries was fitted. Also while at Scania, a team from Northampton-based Signs Express came down to apply the 3M vinyl wrapping, featuring more Help for Heroes and T&D logos. A fairly late addition to the hardware was the chequer-plate catwalk and rear panelling, a job undertaken by SB Components of Wisbech, which had originally been in the frame to make the aborted pickup body. By early summer 2012, Scania’s yard was filling up with new coaches for the Olympic Games, so we decided it would be helpful if the truck was based nearer to the office. Surrey-based classic truck enthusiast Bob Hawkins came to the immediate rescue before our local Scania dealer, Lingfield, took it under its wing. While it was there it gained a new test certificate, following rectification of various issues largely related to under-use, such as seized brakes on the mid-lift axle. 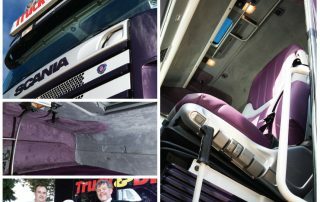 Lingfield also fitted the finishing cosmetic touches – a new set of mudguard tops, replacing ones that had been rescued from the Keltrucks skip as a temporary measure. Before the Pimp My Truck project could go on sale, though, there was one vital task to be completed. Dame Vera Lynn, the legendary World War Two entertainer and a patron of Help for Heroes, had agreed to endorse the project, so one crisp autumn afternoon, three of T&D’s finest rolled up at her cottage in the Sussex Downs. After some tight manoeuvring to squeeze the Scania Topline cab into her garden, she kindly signed the paintwork before inviting us for afternoon tea and the chance for a chat and to view her wartime photo albums. The rest, as they say, is recent history. We discovered early on that the business of raising funds for charity is heavily regulated, so various plans eventually ended up with a sale on eBay, where charity auctions are free of selling charges. The winning bidder turned out to be another independent truck dealer, Nick Walker of Walker Movements Ltd, of Coalville, who generously bid £16,600. So it was that on November 29, all interested parties assembled at the Help for Heroes office at Tidworth, near Salisbury Plain, where Nick acquired a new bit of stock and the charity received a nice cheque. Whatever their donations, large or small, whether that be in time or money, none of this would have happened with-out the help of so many people. Our sincere thanks to them all. For some, their generosity in such cash-strapped times must have been stretched to the limit, but everyone resisted the temptation to tell us where to get off!